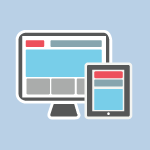 Responsive web design is used to make sure a site is optimized for any device. In this tutorial I’ll create 3 optimized sites in one video and walk you through my process the whole way through. If you have any questions about HTML5 or CSS3 I cover them in these 2 tutorials HTML5 Tutorial and CSS3 Tutorial. All of the code from the video can be found below. I’m sure you will enjoy.